How To Get The Size Right? I love my home made Passing Wind Estates Bratwurst but the buns have always been a problem. Hot dog buns are boring and too small. When I baked homemade on a backing tray, they just weren’t the right shape. So, I set out to make the perfect bratwurst bun. To get a nice shape, I decided I had to cook them in a baking pan with sides. This supports the buns and gives a nice shape. However, I want the buns to be six inches long and my narrowest pans are eight inches wide. I went on line and there are dedicated six inch hot dog pans but they are very expensive and I didn’t want to invest a princely sum to a pan I would only use occasionally. The solution I came up with was to put four small rolls along one edge of eight inch square pans and then cook four buns next to them. It worked great! The recipe for the rolls is below and I have taken pictures of the procedure to make it clear. I started by mixing the flours, yeast, sugar and salt in the bowl of my KitchenAid stand mixer. I put the rest of the ingredients into a microwave safe bowl and heated them to 130 F in the microwave. Don’t worry if the butter doesn’t melt. Add the liquid gradually to the flour as it is being stirred with the dough hook. When it starts to pull from the sides, scrape the bowl. Continue to knead with the dough hook for 8 minutes. Turn the dough onto a floured board and knead if for a few seconds until it is smooth. Cut a quarter of the dough out and cut that into 8 pieces. Form the pieces into balls. Put four balls along one edge of an eight by eight inch pan that has been sprayed with baking spray. Cut the remaining dough in half and form each half into four log shapes. Put them in the pans under the small rolls. Cover the rolls with a towel and let them rise until doubled (about an hour). Bake the rolls in a preheated 375 F oven for 20 to 25 minutes. I like to check the internal temperature with my Thermapen instant read thermometer. If the internal temperature is over 200 F the buns are done. Turn them out onto a rack to cool. Here is the recipe. It is adapted from this recipe at breadworld.com. This recipe makes 8 bratwurst buns and 8 rolls. By making them together, I get perfect six inch long bratwurst buns without having to buy a special hot dog pan. 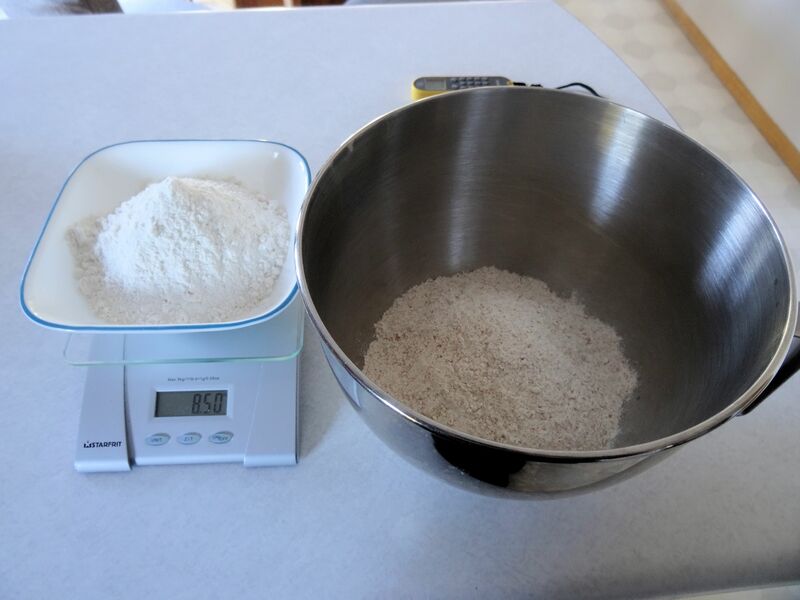 Mix flours, yeast, sugar and salt in the bowl of a stand mixer. Mix remaining ingredients in a microwave safe container and heat to 130 F in the microwave. Start the mixer with a dough hook and slowly add the liquid to the flour. When the dough starts to pull away from the side, scrape the bowl and beater. Knead with the dough hook for 8 minutes or until smooth and elastic. Turn the dough onto a floured surface and knead for a few seconds until smooth. Take 1/4 of the dough and cut it into 8 pieces. Place these along one edge of two eight inch square pans that have been sprayed with baking spray. Cut remaining dough into halves. Cut each half into quarters and roll each quarter into a log shape. Place the logs below the rolls in the pans. Cover and let rest until the dough has doubled, about an hour. Bake in a preheated 375 F oven for 20 to 25 minutes. I use an instant read thermometer to confirm the internal temperature is over 200 F which means the buns are done. Turn onto a wire rack to cool. The shape and size of these rolls was perfect! They remind me of New England hot dog buns and they stand up well to a bratwurst. The flavour had a touch of sweet that goes great with the bratwurst. I really like these buns!